All children are eligible for the Early Years entitlement from the term after their 3rd Birthday. This entitlement covers up to 15 hours of free nursery care per week for 38 weeks a year. Or 11 hours per week if taken over 51 weeks, (stretched funding). 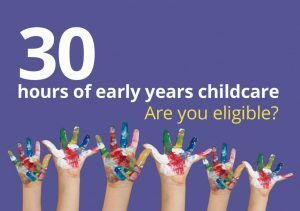 30 hours a week of free nursery care, or 22 hours if taken over 51 weeks is available for families that meet the criteria. In addition, we are an approved setting for families who meet the specific criteria for two year olds funding. We serve many schools in the area and have links to those most local to us.